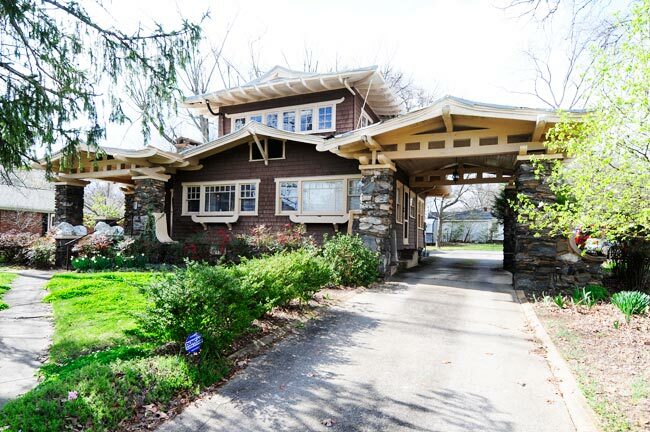 This Japanese-influenced Craftsman bungalow from the 1920s was built for Gaffney resident Dr. J.T. Settlemyer. The home’s design was likely ordered from an architectural catalog; such catalogs were popular at the time. The style itself was uncommon in the South, but it was in fashion elsewhere in the United States during the early part of the twentieth century. Craftsman features of the home include wooden shingles, stone and concrete columns, and a low gable roof. A low stone wall borders the home’s property. Settlemyer was the son of prominent Gaffney banker S.T. Settlemyer, who at one time was the director of the Cherokee Savings Bank. Dr. Settlemyer had no children, so the house eventually was purchased by owners outside the Settlemyer family. Today the home serves as a law office. The Settlemyer House is an excellent example of the Japanese influenced Bungalow design, in the Craftsman tradition, of the early 1920s. The house was built for Dr. J.T. Settlemyer in 1922 and in all likelihood was a mail order design from an architect or catalog home book, although the exact source has not been identified. This type of Bungalow design was also called an “Aeroplane” Bungalow and designs for these types of homes appear in issues of Bungalow Magazine as early as 1910. Few examples of this type of Bungalow were built in the Southeast and this is one of the best remaining examples in the state. The house is of frame construction with an exterior of wooden shingles. It consists of a large two-story central block with one-story wings. The central block features groups of paired six-light casement windows, exposed purlins, and a low gable roof with flared rafter tails. The one story wing at the south end of the main façade has a screened in porch featuring random course stone piers, large knee braces, and a multi-light door. On the north side of the main façade is a porte-cochere with flared eaves and large random course stone and concrete piers. The rear (west) façade has a one-story porch with a flared roof. The lot also includes an original two-story frame garage and a random course stone and concrete wall in front of the house.